Despite having a crappy cold on Friday I had to go out in the evening as I'd promised my old workmates. In order to detract from my burgeoning 'cold face' and glowing red nose I decided to attempt this beehive hairstyle I'd seen in Style magazine earlier in the year. 1) Split hair into two sections from ear to ear. Take the top section and starting at the front of your head backcomb in three-inch wide sections. You will look like a demented Edward Scissorhands. This is correct. 2) Clip the top backcombed section out of the way and roughly tease the bottom section of hair to create texture. This is to help the kirby grips stay in place rather than for volume. 3) Pull all hair back from your face and use a bristle brush to gently smooth down the top layer of hair without losing the 'nestiness'. 4) Draw all hair down towards your neck as if making a ponytail and pull to the right. Place a vertical line of kirby grips from the middle of the back of your head at the nape of the neck upwards until the structure of your hair feels stable. 5) Your hair should still be loose to the right of the kirby grips so gather this hair and twist it back on itself to form a roll. If your hair is long, tuck the ends under near the top of your head. Push the hair into the beehive shape and secure with more grips. 6) Tease out loose tendrils using a tail comb and spray with a matte-finish hairspray that provides medium hold. I used Umberto Giannini Hold Me Curl Hairspray, which I was really impressed with; very fine, smooth mist; smells good and kept my hair in place all night. Sounds like a lot of work but it's really all in the backcombing. The bigger the better. This hairstyle is not a friend of your hair – hello split ends! – but I love an occasional retro look for a night out. What do you think? Fancy trying out a beehive 'do this Christmas? omg how stunning is this. Looks great! Really suits you. 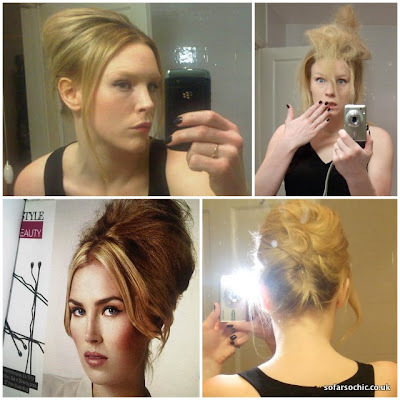 You can use a hair pad, or bun ring to get the volume without backcombing if you'd prefer.